Helen Frankenthaler (Dec. 12, 1928 - Dec. 27, 2011) was one of America's greatest artists. She was also one of the few women able to establish a successful art career despite the dominance of men in the field at the time, emerging as one of the leading painters during the period of Abstract Expressionism. She was considered to be part of the second wave of that movement, following on the heels of artists such as Jackson Pollock and Willem de Kooning. She graduated from Bennington College, was well-educated and well-supported in her artistic endeavors, and was fearless in experimenting with new techniques and approaches to art-making. Influenced by Jackson Pollock and other Abstract Expressionists upon moving to NYC, she developed a unique method of painting, the soak-stain technique, in order to create her color field paintings, which were a major influence on such other color-field painters as Morris Louis and Kenneth Noland. One of her many notable quotes was, "There are no rules. That is how art is born, how breakthroughs happen. Go against the rules or ignore the rules. That is what invention is about." "Mountains and Sea" (1952) is a monumental work, both in size and in historical influence. It was Frankenthaler's first major painting, done at the age of twenty-three, inspired by the landscape of Nova Scotia after a recent trip there. At approximately 7x10 feet it is similar in size and scale to paintings done by other Abstract Expressionists but is a major departure in terms of the use of paint and surface. Rather than using paint thickly and opaquely so that it sits upon the surface of the canvas, Frankenthaler thinned her oil paint with turpentine to the consistency of watercolor. She then painted it onto unprimed canvas, which she laid on the floor instead of propping vertically on an easel or against a wall, allowing it to soak into the canvas. The unprimed canvas absorbed the paint, with the oil spreading out, sometimes creating a halo-like effect. Then by pouring, dripping, sponging, using paint rollers, and sometimes house brushes, she manipulated the paint. Sometimes she would lift the canvas and tilt it various ways, allowing the paint to puddle and pool, soak into the surface, and move over the surface in a manner that combined control and spontaneity. Through her soak-stain technique, the canvas and paint became one, emphasizing the flatness of the painting even while they conveyed great space. Through the thinning of the paint, "it melted into the weave of the canvas and became the canvas. And the canvas became the painting. This was new." The unpainted areas of the canvas became important shapes in their own right and integral to the composition of the painting. 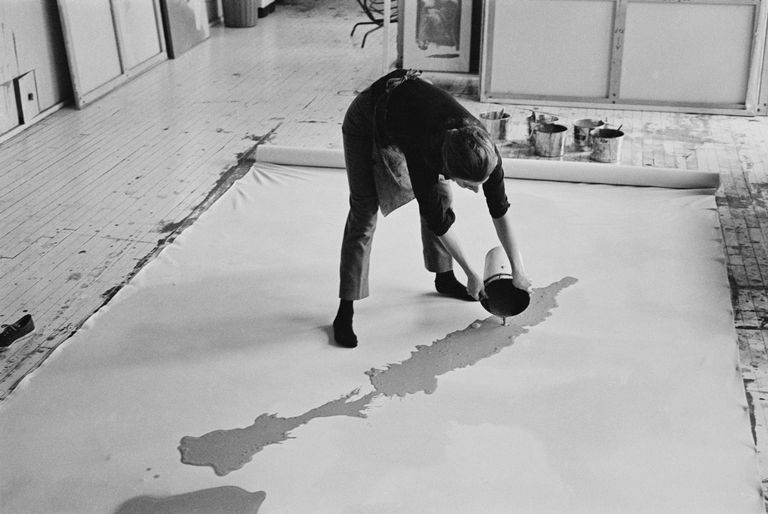 In subsequent years Frankenthaler used acrylic paints, which she switched to in 1962. As shown in her painting, "Canal" (1963), acrylic paints gave her more control over the medium, allowed her to create sharper, more defined edges, along with greater color saturation and areas of more opacity. The use of acrylic paints also prevented the archival problems her oil paintings had caused by the oil-degrading the unprimed canvas. Landscape was always a source of inspiration for Frankenthaler, both real and imagined, but she was also "looking for a different way to get a more luminous quality in her painting." While she emulated Jackson Pollock's gesture and technique of working on the floor, she developed her own style, and a focus on shapes, color, and luminosity of paint, resulting in vivid fields of color. "The Bay" is another example of one of her monumental paintings, again based on her love of landscape, that conveys a sense of luminosity and spontaneity, while also emphasizing the formal elements of color and shape. In this painting, as in her others, the colors are not as much about what they represent as they are about a feeling and response. Throughout her career, Frankenthaler was extremely interested in color as a subject - the interaction of colors with each other and their luminosity. Once Frankenthaler discovered the soak-stain method of painting, spontaneity became very important to her, saying that "a really good picture looks as if it's happened all at once." One of the main criticisms of Frankenthaler's work was its beauty, to which Frankenthaler responded, "People are very threatened by the word beauty, but the darkest Rembrandts and Goyas, the most sombre music of Beethoven, the most tragic poems by Elliott are all full of light and beauty. Great moving art that speaks the truth is beautiful art." Frankenthaler's beautiful abstract paintings might not look like the landscapes to which their titles refer, but their color, grandeur, and beauty transport the viewer there nonetheless and made a powerful impact on the future of abstract art. 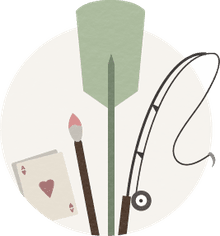 Acrylic Wash and Stain Painting on Raw Canvas: Using Golden Acrylic Flow Release will help prevent acrylic paint from beading on the surface of the canvas. Stain Painting With High Flow Colors and Acrylic Flow Release: A demonstration using high flow acrylic paints on raw canvas saturated with Golden Acrylic Flow Release. Color Field Sketchbook - Lesson Plan: A lesson in how to make a sketchbook using the staining method used by Helen Frankenthaler; good for a gift, or classroom use. Artidote , F is for Frankenthaler, August 4, 2013, https://artidote.wordpress.com/tag/soak-stain-technique/, accessed 12/14/16. Stamberg, Susan. 'Color Field' Artists Found a Different Way, NPR, March 4, 2008, http://www.npr.org/templates/story/story.php?storyId=87871332, accessed 12/13/16. Khalid, Farisa, Frankenthaler, The Bay, Khan Academy, https://www.khanacademy.org/humanities/art-1010/abstract-exp-nyschool/ny-school/a/frankenthaler-the-bay, accessed 12/14/16. Helen Frankenthaler Tribute Film, Connecticut Women's Hall of Fame, January 7, 2014, https://www.youtube.com/watch?v=jPddPgcqMgg, accessed 12/14/16. Fine, Ruth. Helen Fankenthaler : Prints, National Gallery of Art, Washington, Harry N. Abrams, Inc., Publishers, New York, 1993. Stamberg, Susan, 'Color Field' Artists Found a Different Way, NPR http://www.npr.org/templates/story/story.php?storyId=87871332, accessed 12/14/16.